Narendra Shah reviews the life and message of a monk who has had a major impact on the twentieth century Jain history of Gujarat. 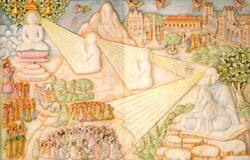 The Jain Samaj has been generally interpreted as an orthodox society, but it is not true. It has witnessed internal movements, a process of reforms and a strong undercurrent of sensible liberalism which have given it new directions time and again. 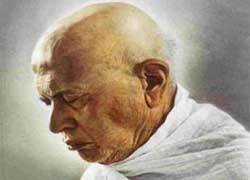 Among these, the most successful twentieth century Jain movement has been spearheaded by Gurudev Shri Kanji Swami. Gurudev was instrumental in starting a new revolution in the percept and practice of Jainism, thereby putting thousands of souls on the true path of salvation. Kanji Swami was born in Umrala, a small village in the Kathiawar region of Gujarat, in V.S. 1946 (1889 AD) to a Sthanakvaasi family. He showed a great ability for learning and was considered the most intelligent student of his class in the school. His mother died when he was 13 and he lost his father at the age of 17. After this, he started looking after his father's shop. He utilised the frequent periods of lull in the shop in reading various books on religion and spirituality. Turning down the proposals of marriage, he confided in his brother that he wanted to remain celibate and take up renunciation. But all this time he could never completely engage with the scriptures he was studying and continued his search for the still evasive Truth. Then, around 1921, he came upon Acharya KundKund's Samaysaar - 'Essence of the Doctrine' - the study of which was like "drinking the nectar of Truth" for him. He followed on by studying the writings of other Digambers such as Acharyakalp Pandit Todermalji and Shrimad Rajchandra. During his discourses he began to incorporate the ideas picked from these studies and began to lead a kind of double life, nominally a Sthanakvasi monk but referring to the Digamber literature.